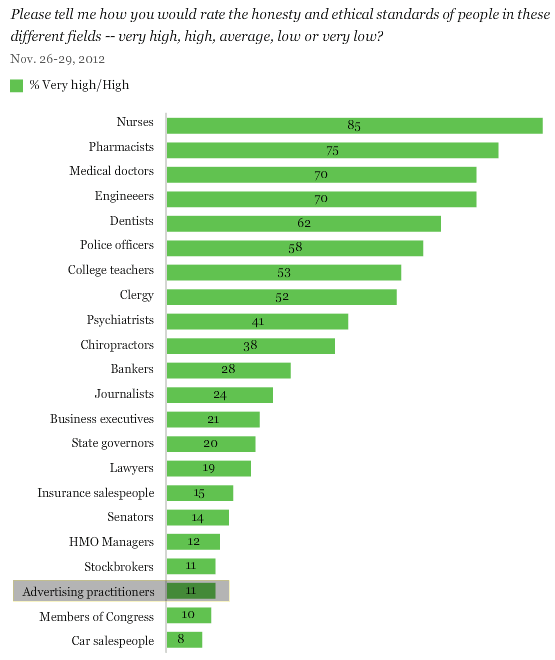 Advertising professionals are near the bottom of the ‘most trusted professions’ list, according to the Annual Gallup survey. According to the annual Gallup survey, advertising professionals are near the bottom of the ‘most trusted professions’ list, scoring only slightly better than members of Congress and car salespeople. TIE intends to change that, from the inside, out. Advertising and marketing needs to stand for more than simply getting people to want more stuff. Instead, we need to make things that people actually want. That talk to them. As human beings. As Alex Bogusky says, we need better products, better conversations, and a better impact. The key is understanding, on a broad scale, what’s changing in the world, and find ways to grow business by doing the right thing. We need to find commercially sustainable ways to fix problems. And our industry is just the industry to do it – as long as we recognise the powerful trends that are quickly emerging. But, for people to be able to know what future appropriate innovation and growth looks like, and to help managers navigate in complex and uncertain environments, we need to change people’s perspectives, get them out of their comfort zone, out of their mould, and thinking and working differently. We need to find ways of growing business by doing the right thing, and through our TIE programmes – Travel TIEs and Home TIEs – we arm the industry with what they need to navigate the future and work better and more sustainably.